Memoticon is an iPhone application which allows you to use your own photo as an emoticon. It is a funny way of using your own face inside all your favourite emoticons you use on your iPhone or iPod Touch. 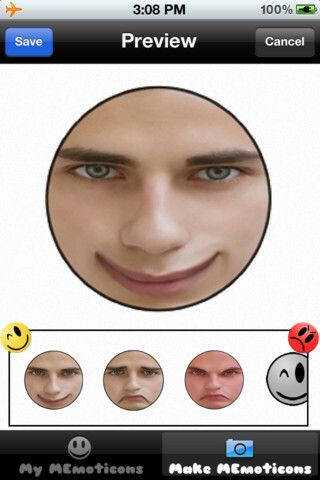 The process of creating your face on an emoticon is simple and straightforward. First, you take a photo of yourself using the front-facing camera on your iPhone by tapping on the camera button of the application. The application will load up an area where align the oval shape with your face. Then, you snap a photo of yourself. The application is smart though. If there is no face detected, it will show an error message that no face has been detected at all and ask you whether you still like to continue with the photo. 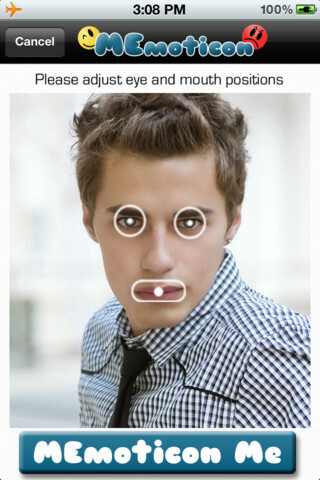 This allows you to retake your photo and choose it wisely to create your customized emoticon. After you have taken a photo, the application will create three standard emoticons of smiley faces and you can use it on Facebook, Twitter or your SMS. It is really a unique way to put your face on an emoticon and shock your friends. They will be definitely curious on how you pull off the stunt of having your face as an emoticon. To use your face as an emoticon on other applications, you can either copy or paste it on your SMS or Facebook chats. You can also share it with your friends using the share function. It will be cool to collect emoticons of your friends and use them in your conversations on your iPhone. However, there is one disadvantage of this application. If you happen to smile when doing the photo taking, the emoticon becomes too exaggerated and the other sad emoticons becomes too fake. 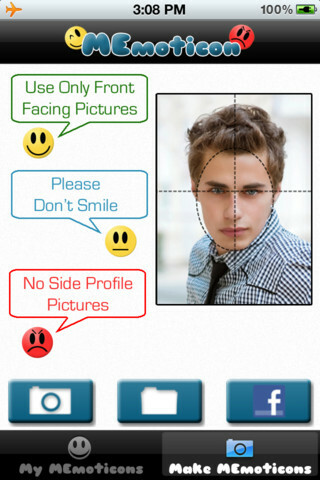 The application does warn people not to smile as a precaution. 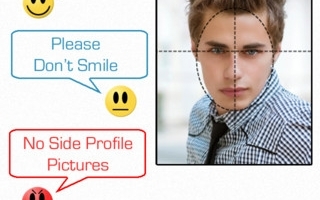 Furthermore, you cannot take photos showing the sides of your face as an emoticon. It does not work great with side photos. You can also choose your photos in your photo album on iPhone to use them as emoticons. The list goes on. It depends on how creative you are in using this application to make your emoticons. Bring this application on an outing with your friends and snap photos of their faces. Do exercise caution by asking them for their permissions first before using their faces as emoticons. Some people may not take it that well if you did not ask for their permissions to use their photos. It is definitely a fun application to use to create that special emoticon nobody has.